Thanks to the proliferation of mobile, social and cloud-based technologies, customers today have higher expectations than ever. Increasingly, customers want to engage with companies on their own terms, serving themselves through digital channels rather than calling into phone centers. In order to meet the changing demands of their customers, organizations need the right solution that can help them harness the vast amounts of customer data in ways that yield personalized, seamless customer experiences. 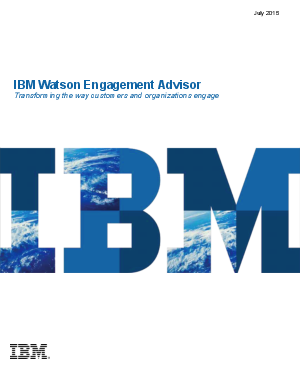 That solution is IBM Watson Engagement Advisor.